This polyptych is almost five meters wide. 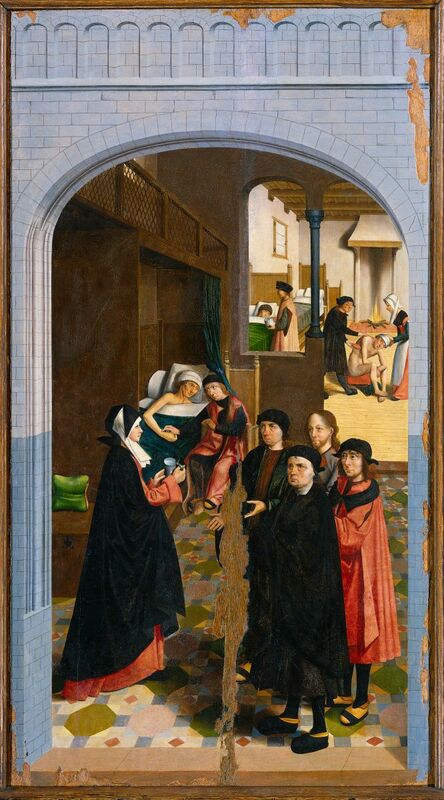 It deals with the seven works of mercy or charity and was commissioned in 1504 by the regents of the Holy Spirit Hospital in Alkmaar, the Netherlands. As there are various theories about its maker, the artist has entered history as the Master of Alkmaar. Most probably it concerns the painter Cornelis Buys, who was active in Alkmaar from c. 1490 to 1524. The work was badly damaged during the Iconoclasm of 1566, when Roman Catholic churches were vandalized by Protestants. This heptatych is the oldest still existing depiction of the works of mercy from the Northern Netherlands. In the Holy Spirit Hospital in Haarlem hung a similar work by Geertgen tot Sint Jans, which unfortunately was lost. It may have functioned as a model for this work. A maxim was written beneath each panel. These sayings give us a good impression of the Dutch late-medieval way of thinking, complementing the panels in this sense. A Dutch town forms the backdrop to this picture narrative. It is a tidy town with only brick houses, a prosperous and exemplary place. Well-off burghers in contemporary clothing give bread to the poor. In the foreground a group of paupers crowd together at the door of one of the houses. While a woman holds up a basket with bread, her husband hands it out. He does not pay attention to those on the receiving end and in this way he does not let his left hand know what his right hand is doing (Matthew 6:3). He hands a bun to the man in the red torn mantle with a child on his shoulders. The man is blind. He is lovingly held by the hand by his wife, who with her other hand gives bread to the child on the ground. They may be needy, but they are together and not without love! In the foreground we see a man with deformed feet, who in the social order of ranking knew himself to be even lower than the poor. Yet he is given a lot of space in an important place in this panel. And who stands inconspicuously between the beggars right in the middle of the panel? It is Jesus, recognizable by his traditional Jesus face: long and narrow, with long hair, a parting in the middle. In contrast to all the others he looks the spectator in the eye and says: “Truly I tell you, just as you did it to one of the least of these who are members of my family, you did it to me” (Matthew 25:40). At the right in the second scene we see an especially dignified residence with steps and pillars. Even so the master and mistress of the house personally distribute water to a group of people consisting of six grown-ups – Jesus among them – a cripple and two children. Jesus is looking kindly at the ‘donor’ who pours out the drink. A nice detail is that the jug with the coveted liquid is located in the very middle of the composition. In the background we see a woman who provides a blind man and his companion with water. One wonders whether there were no pumps around at that time, where people could go to fetch water. But that is of not really of importance here, as this panel is about the portrayal of Jesus’ words in Matthew 25. The polyptych wants to urge the viewer to charity. It is a didactical work, just like the paintings of the Master of Alkmaar’s contemporary Hieronymus Bosch. Especially the large man who just gets poured a drink has a Bosch-like face. Nowadays art historians assume that the master from Den Bosch was influenced by the Brethren of the Common Life, who had two houses very close to his studio. 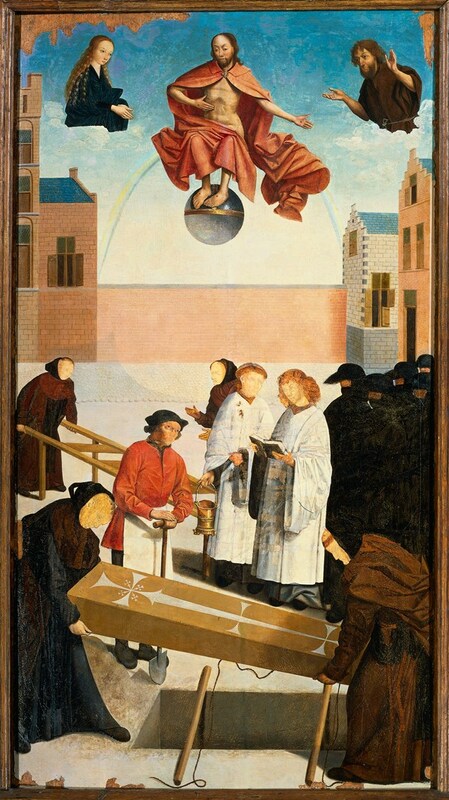 This could also apply to our painter from Alkmaar, as the Devotio Moderna (Modern Devotion) practiced by the Brethren of the Common Life emphasized a personal and practical faith. What we do not see here, however, are the Bosch-like devilish creatures and demons. Our artist clearly opted for a friendlier visual language. In the foreground of the third panel a man in an opulent mantle clothes a beggar with a new undergarment. He has already given him a new cloak, putting Matthew 5:40 in practice in this way. Behind them a group of men approaches a couple. The one in front makes a pleading gesture. Apparently autumn is drawing near and his ragged cloths will not be able to protect him against the cold. The man of the couple looks attentively at him. He is not just doing a ‘good work’, but seems to be truly sorry for the poor man. Jesus can be found among the vagabonds and vagrants again. He identifies with them. He ‘sym-pathizes’ with them, shares in their suffering, and incites the viewer to do the same: to activate their imagination and to (literally) put themselves in the shoes of the less fortunate and imitate him in his compassion and mercy. This makes us think once more of the imitation of Christ, the Imitatio Christi by Thomas a Kempis, one of the foremost exponents of the Modern Devotion. This book, as the most read book in the world after the Bible, proved to be hugely influential in western history. Six of the works of mercy derive from Matthew 25. In 1207 Pope Innocentius III added a seventh work: burying the dead, for which he based himself on the apocryphal book of Tobit, which stresses the care for the deceased. In this panel we do not see the bourgeoisie in action, but the clergy. It were the priests and monks who took care of burying the rich and the poor in the Middle Ages. To the right of them we see the male nurses who cared for the people with pestilence, recognizable by their black suits with beak masks. In this beak herbs were stored to counteract the ill-smelling fumes which – so they thought – spread the feared disease. A frightening sight! Yet it were these men who risked their lives by caring for the plague victims and it is therefore beyond doubt that they deserved a place in the row of exemplary people. Also Jesus is compassionate towards the sick and dying, but this time not as one of them or their nurses but as the righteous judge on the Day of Judgement. He is seated on the rainbow of the covenant as the King of the Universe. By placing this panel in the middle, Jesus towers above all of the scenes. In this way the artist links the works of mercy to the coming judgement, just like Matthew 25 and the maxims do. With one hand Jesus points at the wound in his side, with the other he shows the wound in his hand. Thereby he emphasizes his own suffering, his ‘sym-pathy’ and mercy. In the foreground of this panel a burgher couple welcomes seven strangers, Christ among them. They extend their hospitality with cordiality and loving attention. 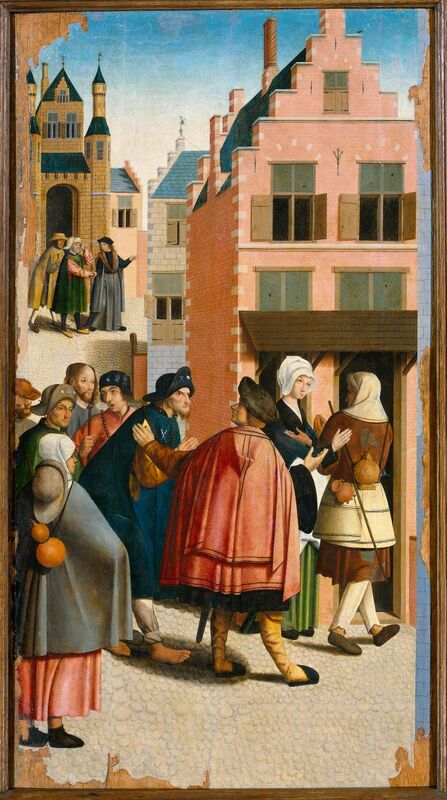 In the background a woman takes a possibly blind man by the hand to show him and his companion the way to her house. There are several pilgrims among the travelers. They are recognizable by their hats, jugs, prayer chains and pilgrim's staff. The pilgrim badges that they wear on their hats and cloaks, are symbols of the places of pilgrimage they visited. Scallops were acquired in Santiago de Compostella in Spain, while Saint Peter’s Keys came from Rome. They are small lead-tin pins with various depictions. With the help of metal detectors thousands were dug up in the Netherlands in the past decades. Pilgrimages were undertaken to obtain God’s blessing and an indulgence for sins. In this time just before the Reformation there was a lot of criticism of these kinds of external religious forms, through which one supposedly could secure one’s salvation. 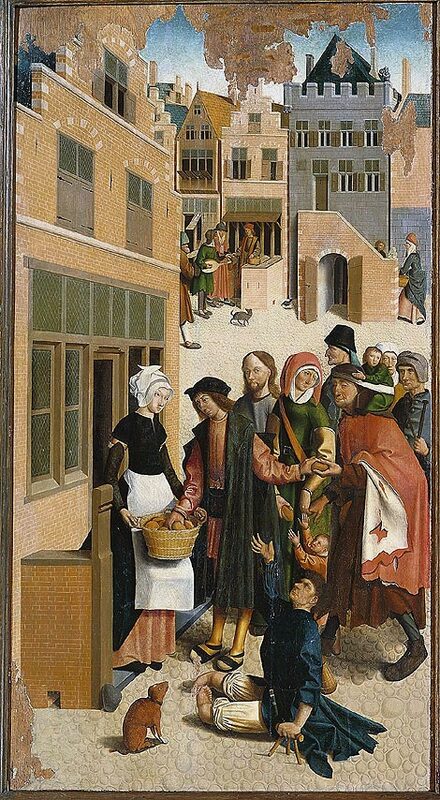 The Master of Alkmaar paints the benefactors in this panel in such a way that they make clear that true charity is not rooted in the compliance with regulations, but in sincere compassion. This sixth panel is the only one that shows us an interior. It could very well be the Holy Spirit Hospital in Alkmaar. These hospitals, in Dutch called gasthuizen (literally guesthouses), were first of all meant to care for the sick and the old, but they also provided the needy with bed, bath and bread. The hospital in Alkmaar was founded by the parish, but elsewhere they were also started by burghers. Usually the beds were placed along both sides of an elongated hall, four or five of them in this case. In the first one lies a woman, who is lovingly visited by her husband. In the second (or third) bed a patient is just given a drink. The next bed is still empty, but seems intended for the man who is just being washed near a nice warm fire. In the front Jesus is standing among a group of men, probably the hospital masters who commissioned the polyptych. They are pleading with the stately woman, who seems to be in charge, for a place for this new patient. The message, however, seems to be that there is no place for him in the ‘inn’. It is, of course, a reference to Luke 2:7, where it is told that Jesus had to start his life as a poor homeless infant in a measly stable. Her refusal is the only dissonant in the world of ideal charity the panels present to us. In this most right panel we look inside a prison. In the foreground a number of visitors stand before a gate. Behind the barrier we see the outside space of the prison, behind this a corridor that runs along the cells and only behind this the cells themselves: four layers in total. The artist seems to have become confused himself by all these layers: the man who is being whipped stands in the second layer, while the man who is hitting him (and the whip) is partly located in the third layer. The whip is placed in the center of the composition. Everyone is reacting to its painful violence, each one in their own way. 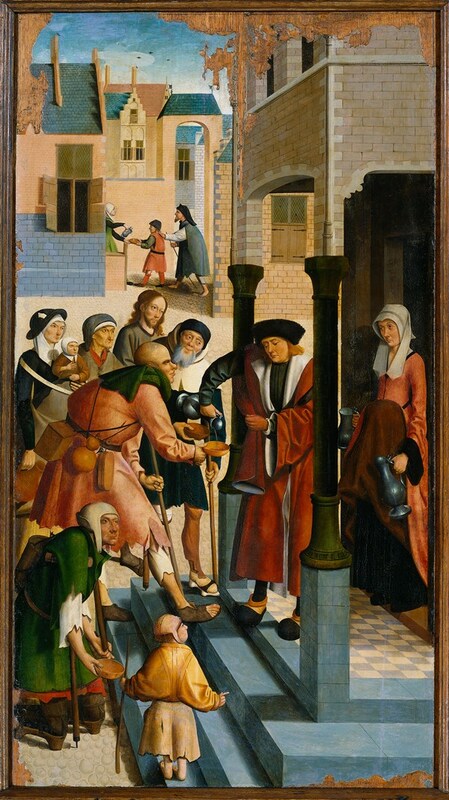 The people in front of the gate try to persuade the man with the whip to stop his flogging by offering him money. The woman in the middle must be the wife of the victim of the beating, as she is looking pleadingly at the woman to the right. The man at the left is already groping in his pouch as well. The fellow prisoner on the ground attempts to get out of the way of the whipping. To the right behind him Jesus is standing, who knows very well what it is like to be flagellated. He is literally standing at the side of the prisoners, of the sinners, while being portrayed as ‘Salvator Mundi’, the Savior of the World, with the globe in his hand. He blesses the whipped man and with him he blesses all the suffering people depicted in these seven panels. This is how he brings an end to the visual story and summons the spectator also to be a blessing for all who are in need. The Modern Devotion employed images (paintings, sculptures, illustrated manuscripts, pamphlets with woodcuts etc.) in support of a life of faith. People could (and can) look for a long time at these panels, ponder them and stumble upon new details and insights – with the intention to grow from the inside out into a life committed to compassion. Within the scope of this meditation there is room to discuss only four of the seven panels. The discussion of the last three panels will be next week’s meditation. 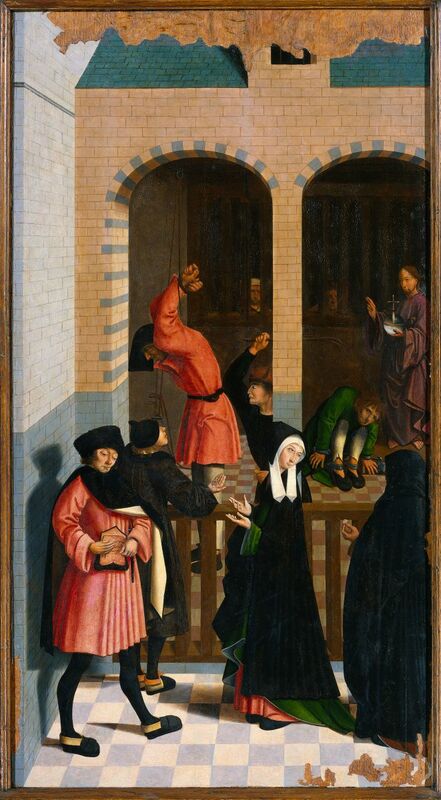 The Master of Alkmaar: The Seven works of Mercy, 1504, oil on panel, 120 x 472 cm, Rijksmuseum, Amsterdam. 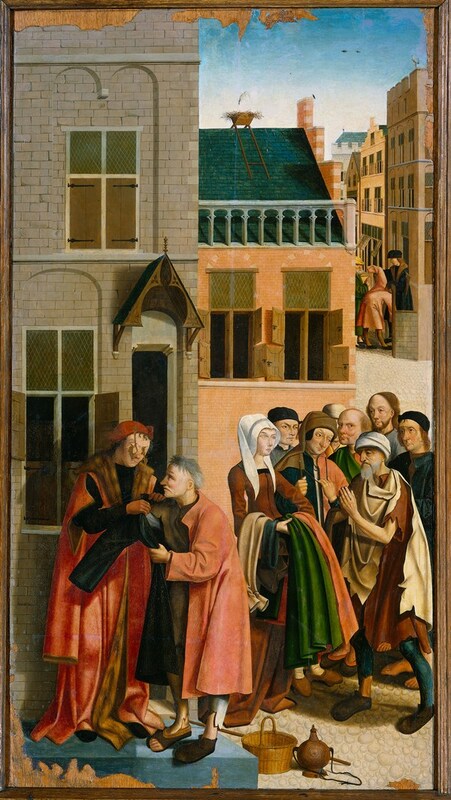 The Master of Alkmaar owes his name to a series of seven panels painted in 1504 that depict the Seven Works of Mercy or Charity. The paintings, bearing a similarity to the works by Geertgen tot Sint Jans, are done in bright colors and their figures are drawn in an exaggeratedly caricatured manner. It has been proposed that this artist is identical to Cornelis Buys, who is in turn thought to have been a brother of the painter Jacob Cornelisz. van Oostsanen. Cornelis Buys worked in Alkmaar from 1490 to 1524. In 2016 this discussion of The Seven Works of Mercy by the Master of Alkmaar was published in Dutch by Buijten & Schipperheijn in the book Barmhartig leven, met reflecties vanuit het leven en werk van Dietrich Bonhoeffer by Arthur Alderliesten.